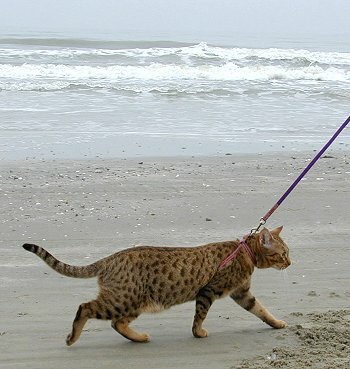 Often referred to as "the athlete of the cat world", the Ocicat is a short-hair spotted cat with good musculature and medium to large size. 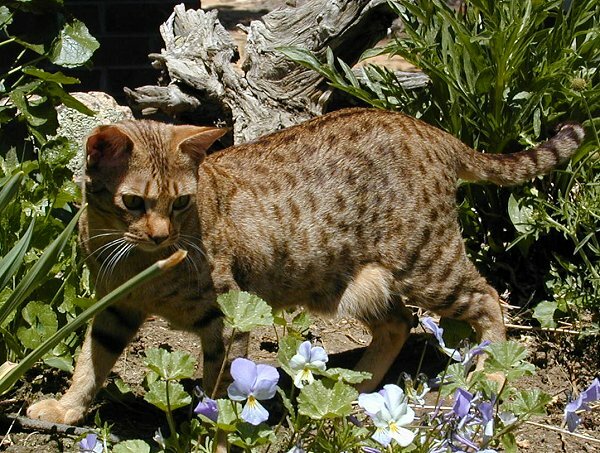 This relatively new breed of cat (started in 1964) has its genetic origins from the domestic Abyssinian, Siamese, and American Shorthair cats. 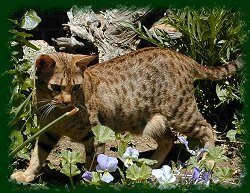 Its tight short coat makes it easy to care for, and its hardy ancestry makes this a vigorous and healthy addition to any household. 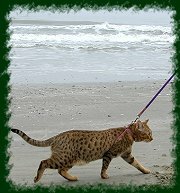 The exotic spotted pattern and head shape make this a wild-looking animal, sure to turn heads. We often have visitors to our home who stop short and ask if our cats are wild! Yet their disposition is wonderful, belying their looks. They are friendly, out-going, and playful. They like to be around people; in fact, we have had some who, distracted by playing elsewhere in the house, soon wander around as if lost, crying until they find a person to visit! They like to play both with other cats and with people. 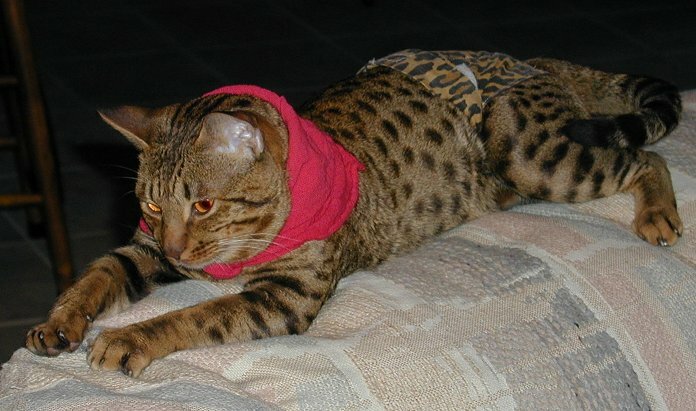 They spend hours playing with a multitude of toys by themselves or with other cats. 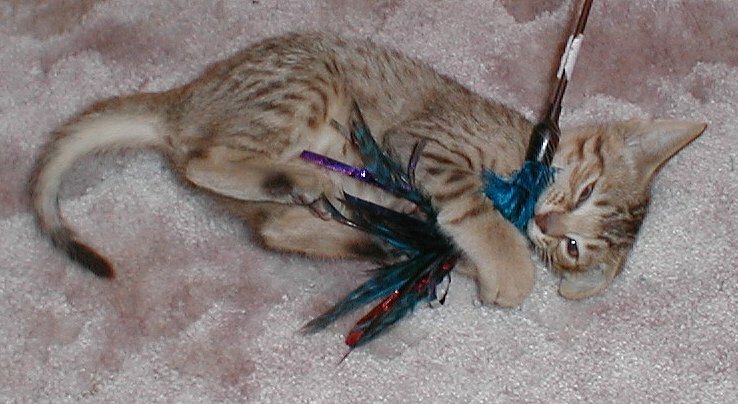 They'll love you if you wave a feather toy around for them. Many will fetch a favorite toy and bring it back to you, just like a faithful dog (actually, better than dogs in our experience!). If you work with them, they will walk with you on a harness/leash. And at the end of the day, most will curl up on your lap or on the sofa next to you. Ocicats are very intelligent. Maybe too intelligent! We have two who can open any closed door in the house. And they taught themselves how to do this. One would sit in front of the door through which someone just left, and would study the door lever for long minutes, having observed the person use the lever to open the door. She would then jump up on the handle and claw at the door (oh, our poor doors!) trying to figure out what to do with it. If unsuccessful, she would sit at the bottom of the door studying it again, trying to figure out what she did wrong. After many sessions, she now goes through a closed door as quickly as any human! Click on the photo on the left to select a video of "Brat" in action! We're sure you will be delighted with the looks and personality of these wonderful companions!